If you need a prompt yet professional microwave repair Morristown service, look no further and call our company! These days, microwave ovens have become some of the most helpful home appliances. Whether you want to warm up the leftovers, prepare a quick dinner, or defrost frozen food, there is no task that this small unit can’t handle. That is why it can be really frustrating when your microwave lets you down all of a sudden. But here is some good news for you! No matter where you are in Morristown, New Jersey, we are ready to provide you with a skilled local technician that very day. By being highly qualified in the field, the pro will take care of all your microwave service needs in a jiffy! We know that microwave ovens are relatively cheap. But it doesn’t mean you should buy a brand new model every time your current unit breaks down. It would be far more cost-effective if you invest in regular microwave service in Morristown. That way, you will be able to distance yourself from undesirable failures as well as save money in the long run. So don’t hesitate calling us to book a full inspection today. 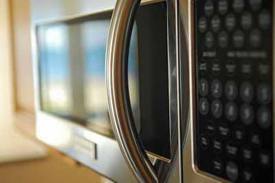 With our company, any Morristown microwave repair and preventive service can be as easy and trouble-free as possible. Let us prove it to you!